Students attending class in Georgetown University’s new Rafik B. Hariri building will notice the stunning results of the two-year construction project. Merical Electrical Contractors installed all of the electrical systems in the recently LEED Silver certified building. The Upper Marlboro, MD–based electrical contractor installed intricate lighting systems, teledata systems, fire alarm and security systems, lightning protection systems and the audio/visual infrastructure. Nothing about the lighting was standard. The system included pendant mounted, cable mounted and cove mounted high-end fixtures. In addition, motion sensors and motorized window shades contributed to the LEED certification by controlling the amount of light the system should provide in each room. 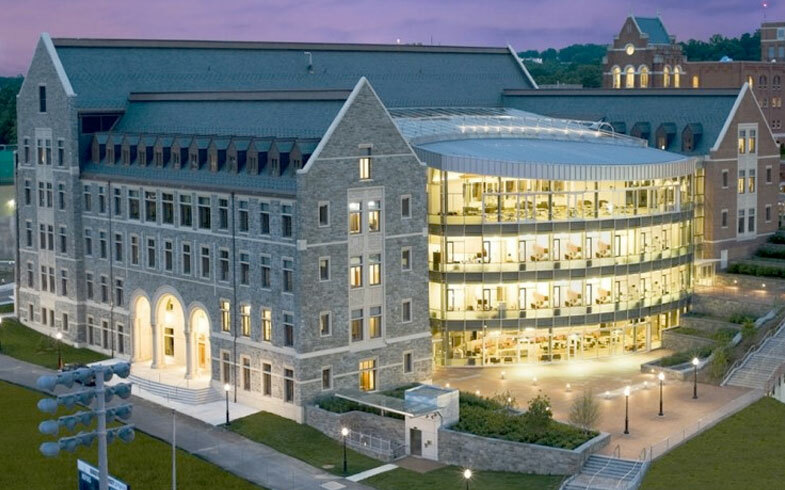 Georgetown University expects up to a 15 percent energy savings through the efficient lighting design and control system. The smoke evacuation system also required a lot of interface with the building automation system so that doors, windows and dampers will open and close to remove smoke from the building in the event of a fire. Merical has installed a similar system at Northview Elementary in Bowie, MD. The building’s design which included tiered classrooms and a large atrium complicated the project for all of the trades. There was a lot of coordination due to the large open atrium and the trade used CAD to create 3-D models regularly to coordinate the trades in the atrium’s ceiling space.